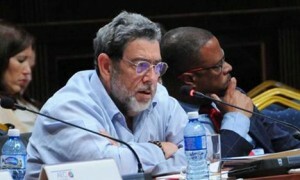 HAVANA - Dr Ralph Gonsalves, prime minister of St Vincent and the Grenadines, reaffirmed on Saturday in Havana that integration in Latin America and the Caribbean is a possible, realistic path and that its consolidation will make it possible for countries in the area to face common challenges. Speaking at the seventh summit of the Association of Caribbean States (ACS), Gonsalves urged the region to work together and to use honest dialogue to resolve differences, thus promoting genuine friendship. In the presence of heads of state and government, as well as delegations taking part in the high-level session of the meeting, he said that the Caribbean countries are united by history, geography and biology, reasons why they should work together. The prime minister emphasized that, in order to achieve the common good, it is essential to maintain a dialogue on air and maritime transport, trade, tourism and technology. Gonsalves mentioned that the countries washed by the Caribbean Sea had to face colonialism, slavery, genocide and imperialism, and with such precedents it is urgent to defend the sovereignty of the region. Referring to commercial relations with Cuba he pointed out that one of the main obstacles continues to be the economic, commercial and financial embargo imposed by the United States on Cuba. In turn, Dr Keith Rowley, prime minister of Trinidad and Tobago, said his country gives solidarity support to its Caribbean neighbours on the basis of the common objectives of the ACS, and they are committed, on this premise, not to interfere directly or indirectly in the affairs of other nations. In addition, he advocated that the members of the ACS take part in other forums as a single nation, in which all of them must be recognized and respected, he suggested.